Organization is a great skill that not many people possess. But, you don’t have to be an organizational guru to keep your home in great shape. Every space can be tackled in 15-30 minutes depending on its size. In order to organize your space in an instant, try these helpful hints! You will need a garbage bag, a laundry basket (or plastic bin), an all-purpose cleaner and a rag or cleaning cloth. The key is to start small and then move into bigger spaces. You will not be able to tackle every space in your home in 15 minutes. However, if you take a little bit of time out of each day, you will have an organized home before the week is through! Your first move is to find a messy space. A closet drawer is a great place to begin. Once you’ve selected your space, set a timer for 15 minutes. Empty the contents of the space onto the floor, table or other clean surface. Put a small amount of the all-purpose cleaner on your rag and clean the inside of the closet or drawer. Leave the closet or drawer open while you complete the next step so it has time to dry. Generally, all-purpose cleaners dry quickly and leave a very pleasant smell. While you’re waiting for your drawer or closet to dry, start sorting the items you removed from it. In the garbage bag, put everything that you wish to toss. There’s no point in keeping clothes that are tattered or worn or items that no longer work (like old technology such as Walkmans or floppy discs). This stuff will never gain value; especially if it’s been used, so throw it out. The laundry basket is for the items you plan on donating. Places like the Salvation Army and Value Village take everything from furniture to clothing to cookware. If it’s in decent condition and you won’t use it, it’s guaranteed that someone who is less than fortunate can greatly benefit from your stuff. At this point your drawer or closet should smell terrific and you can deal with the items you want to keep. 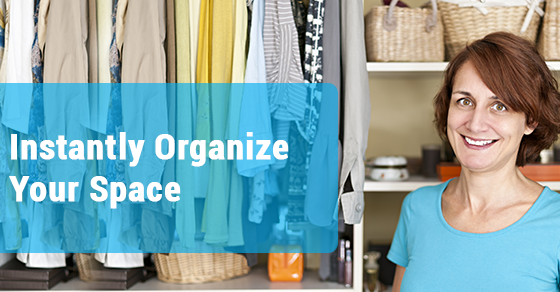 Before placing everything back in the drawer or closet, organize the items so that they won’t get easily messed up. For example, if you’re folding clothing to put it back in a drawer, make sure it’s easy to take out so that you only have to remove the item you want instead of having to take out T-shirt after T-shirt to find what you want to wear. For the closet, try grouping items together so they’re easy to find. That’s it! You can stand back and admire your clean space. For more cleaning tips and ideas, stay connected with our expert team!